What Does a Human Resources Specialist (MOS 42A) Do? The Human Resources Specialist falls under Military Occupational Service (MOS) code 42A. 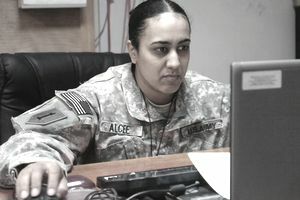 A Human Resources Specialist (HR specialist) primarily helps Soldiers develop their Army careers, which includes providing promotion and future training information, and also includes personnel support and assistance with regards to transfers, travel orders, and salary details to all divisions of the Army. The Human Resources Specialist in the Army HR department of any given command does the career administrative work of the Army. A long list of duties is involved in the 42A job and the HR Specialist handles many duties and tasks, including annual evaluation details from the processing, coordination of requests, as well as responding to inquiries of evaluations when one party does not agree with performance grades received. Work with soldiers who are eligible for promotion and even arranges the promotion ceremony with the chain of command. Arrange for soldier's removal boards and handle any disciplinary documentation when a soldier loses rank. Evaluate soldiers' career desires and qualifications for advanced assignments and prepares and processes requests for transfer or reassignment. Process classification or reclassification actions. Prepare orders and request for orders. Prepare and maintains officer and enlisted personnel records. Prepare and reviews personnel casualty documents. Monitors suspense actions. Initiates, monitors, processes personnel evaluations. Transfer records to the new home of record or new duty station. Process personnel for separation and retirement. Process and executes Personnel Service Center SIDPERS level procedures and actions. Process applications for OCS, warrant officer flight training, or other training. Process recommendations for awards and decorations. Initiate action for passports and visas. Testing: Interested candidates must take the Armed Services Vocational Aptitude Battery (ASVAB). The required scores for this job are: General Technical (GT) score of 100 and Clerical (CL) score of 90. Training: Those interested in the HR specialist position must begin with the 10-week Basic Combat Training. Following this, they will need to complete nine additional weeks of Advanced Individual Training. This training includes instruction on the job in human resource systems, with part of the instruction taking place in the classroom and part in the field. Based on your assigned unit, additional training may be available for other opportunities, including airborne or air assault school and postal operations. Typing: Candidates need to possess the ability to type at a minimum speed of 40 net words per minute. Special aptitudes: An aptitude for English and skills in business administration are helpful. Ability to follow orders: Attention to detail and ability to consistently follow orders is important in this position. People skills: The ability to communicate well with a variety of personnel will serve candidates well. Once your military service is complete, you'll find that many civilian companies have a need for HR professionals with experience in records keeping, human relations, payroll, and other facets of the human resources function. For the HR specialist job, you may also be eligible for civilian employment after completing your time in the Army by enrolling in the Partnership for Youth Success (PAYS) program. Your participation will help you land guaranteed interviews with military-friendly companies such as Amazon, Office Depot, The Pep Boys, and Zions Bank. These companies and others want trained and experienced Veterans to join their organizations. The job of an HR specialist is performed in an office setting and can be located either on land or aboard a ship. Take the ASVAB Test and achieve the appropriate ASVAB Score of 90 in aptitude area CL, and 100 in aptitude area GT.